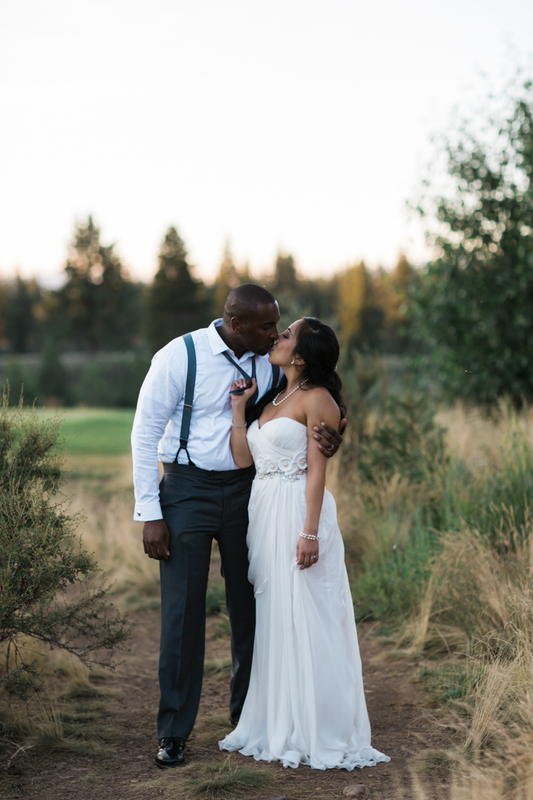 "Gabriel is the best wedding photographer you can find in the Reno/Tahoe area. After my husband and I had been in several bridal parties and seeing a number of photographers, I knew how important the photographer is on your wedding day. Gabriel was the perfect choice. From the very first meeting, I knew that Gabriel is artistically talented and a good businessman. He is very responsive during the planning stage. He did a walk-through with us at our venue about a month before the wedding so he could check the lighting and see the best spots nearby for pictures. Our wedding was in Reno on 10/7/2017 and we had the most incredible fall photos. Gabriel was with us throughout the entire day, from getting ready to dancing late into the night. He never pushed us; he simply captured us interacting with our friends and family. He captured every important moment throughout the day. After the wedding, we got our entire online gallery so quickly and several photos I didn't even realize Gabriel was there for that certain moment. I am beyond happy/elated/stoked for the photos we have. He did such an incredible job capturing our day for all of the years to come. Gabriel also photographed a boudoir shoot as a surprise wedding present to my husband. It was a fun and confidence-boosting day for me, who has never done anything of the sort. Gabriel was very professional, and my girlfriends and I had a blast. He made me look my best and knows the most flattering angles. I would recommend him for a boudoir shoot too!" I can't say enough about how incredible it was to work with Gabriel. I was nervous initially choosing our photographer for obvious reasons. I went with my gut and hired Gabriel. He over delivered in many ways. He was patient, flexible and payed attention to the small but very important details. Gabriel was super personable and a delight to work with.That's all just about him, now his talent is exceptional. He captured all the important moments and has quite an eye for what will look best. He blew me away when he texted me the next day with 13 gorgeous shots he took. The day after that he presented me with all prints of those 13 shots. Like I said he over delivered. You can't go wrong hiring Gabriel Radu! When we were "shopping" for a photographer for our daughter's wedding, I came across Gabriel's website! What impressed me the most was his ability to capture the moment. There are several pictures on his website that gave me chill bumps and made me feel as if I was experiencing that moment in person! Very happy with Gabriel agreeing to photograph our daughter's wedding. He was very accommodating, he was always on time and beyond a pleasure to work with! A hired photographer that felt more like a family member during and after our event! His pictures were ready way before expected and, of course, did not disappoint! What a blessing!!! Thank you Gabriel, you're the BEST! My partner and I got married at plumpjack in March during all the snow and our pictures blew us away, they are amazing! If your looking for a photographer then Gabriel Radu is perfect. My partner and I do not like posing for photographs and he made the whole experience very easy, relaxed and fun. The ideas he had for photos in the snow worked so well! He captured all the family pictures we wanted and casuals one of people talking and enjoying themselves. Exactly what we asked for and more, we forgot to say we wanted pictures of the food, tables and reception room before everyone arrived but he had already done it! He thought of everything. Nothing was too much trouble even when we asked for extra ones to be taken. He was so professional and friendly to everyone involved in the wedding. Could not recommend Gabriel highly enough he was awesome! We hired Gabriel to be our photographer for our wedding on a yacht on Lake Tahoe on June aand we absolutely loved working with him!! The quality of his photos is amazing. There are quite a few, especially during the sunset, that are beautiful art. He captured the happiness and emotion of us and our guests as well as alI the little details I cared about (pics of my dog, my dress/shoes/jewelry, our cake, the roses, signing our marriage license, etc. ), and he captured the environment of our wedding so well. As the bride, I was swept away in the moment and didn't always have the time to look at the scenery during our cruise. I am so grateful Gabriel was there to capture the beauty of Lake Tahoe because I have looked back at those pictures and I have been stunned that I was able to get married at such a beautiful place. As for his character, he is incredibly professional and down to earth. He gave us a wonderful first impression. He is sweet and energetic about his craft. He showed up to our venue extremely early and was able to get wonderful photos of us all getting ready for the wedding and great shots of the pier/lake before the cruise. He was also VERY patient with all of our requests. My dad asked him to fit almost everyone in the family in a few of the photos and Gabriel was kind and great about obliging us!! Gabriel worked non-stop and took over 1,000 photos for us!! The way he edited our photos made all the colors POP. He also included a number in black and white that are classic and gorgeous. True to his word, he provided all of our pictures within 2 weeks of our wedding via his website. He also sent us a USB flash drive of the photos. They have been a JOY to look at again and again! I am so happy that we hired him! He is worth every penny! Thank you, Gabriel!! Gabriel did an amazing job photographing our wedding day! We had a very small and intimate ceremony and we wanted pictures taken at the Church as well as on the way to and at Lake Tahoe. Gabriel was very accommodating and professional. He went above and beyond what I expected and the pictures came out beautiful! He captured so many spontaneous special moments as well as setting up wonderful group and individual portraits. Since we did not have a traditional wedding and reception – he worked with us and gave us a custom price. I highly recommend Gabriel to anyone needing a professional photographer; he was fantastic and a pleasure to work with! There is only one word to describe Gabriel Photography....EXCELLENT!!! We had him do our engagement and wedding photography. He was fun, professional, and gave us great pictures. His lighting techniques, decisions on black and white, etc were great. On our wedding day he showed up almost as we were waking up in the morning and didn't stop taking pictures until our reception was over late at night. Not only did we love having him around to capture the memories, but our family couldn't stop talking about how great he was! The value we received in our photography package was so affordable and extraordinary! Gabriel Photography provided us with flash drives of ALL our engagement and wedding photos, a large wedding album for ourselves, two smaller albums for our mothers, and surprised us with a wall calendar of wedding photos. We would have expected to pay double or triple what we did for everything we took away. We can't say enough good things about Gabriel Photography, and are recommending him to all our friends in the area. If you want top of the line pictures and professionalism at a great price, then you want Gabriel Photography for all your wedding needs! I could not have been happier! Gabriel did an amazing job; earning each and every one the 5 Star ratings I gave him. From the very first email, to the day of the wedding, to the final product, I could not have asked for, or received a more skilled photographer. He literally sent me a few teasers pics the very next day. Not only was he an absolute professional, but he had patience of a saint, and went well beyond my expectations...not to mention the value of provided services. He is more than reasonable! I paid triple for my daughters wedding photographer, and received nothing even close in comparison. You could not go wrong with Gabriel! Gabriel did a phenomenal job with our wedding photos! He was punctual on the day of our wedding and very responsive to emails and inquiries from the beginning. He gave us great suggestions for photo locations and made sure that everyone was photographed throughout the night making for some very memorable photos. The quality of the photos is top notch as well. Gabriel knows what he's doing and makes for a very smooth photographer! We would recommend him to all. Gabriel has such an amazing talent for capturing moments which is exactly what we wanted for our wedding. By looking at the photos, we are able to completely relive that whole day from beginning to end. Although breathtaking, it's not the formal photos that remind you how great your day was, it's the fun & natural candid ones that bring back the memories. He was very professional, fun, and the quality of service is unparalleled. Gabriel's energy and passion shows in every photo! We did engagement photos with him as well and that is a day we will never forget. We had a blast. I highly recommend Gabriel Radu for ANY event as he provides first class service and memories to last a lifetime!